Let us remember our brothers and sisters in Christ in this month of November, in the depths of purgatory, longing to see the face of God and be with Him in Heaven. Our prayers will relieve their sufferings and help them reach Heaven more quickly. Although they cannot pray for themselves, they can and will pray for us out of gratitude! The Holy Mass--this is the most powerful way to relieve or release a soul from purgatory. The Mass is the sacrifice of Christ Himself; He offers Himself up as the perfect sacrifice to God, and through this sacrifice, "with all the merits of His Death and Passion, He will not refuse us anything". The Holy Rosary and the Stations of the Cross--most powerful Marian prayer we have and the contemplation of Christ's sufferings brings great relief to the souls in purgatory. 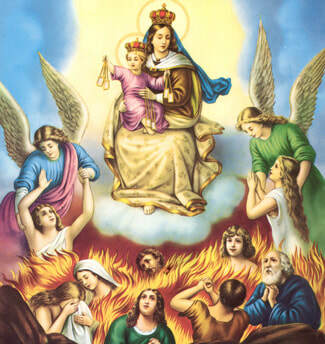 Through the Rosary, many souls are delivered from Purgatory each year, and the Mother of God herself comes to Purgatory to deliver the souls. That is why the souls call Our Lady the "Mother of Mercy". Sacrifices---another powerful means to help the souls, through the offering of our daily pains, struggles, and renunciations for their relief.